P115LF-SS is rated 2.6 out of 5 by 5. Rated 5 out of 5 by Janet from It works. I bought it because mine was broke.I needed a faucet no other reason. Rated 1 out of 5 by Neil from Problem: Gasket does not fit the faucet I bought this faucet at Walmart on Feb-04-2016. Today Feb-07-2016 I am in the middle of installation and find a problem, the gasket does not fit the faucet. It's 6:00 AM, later this morning I plan to look for a better faucet at Lowe's, and return this one to Walmart. This faucet is a replacement for the same model I bought several years ago, one with a "lifetime" warranty. That faucet developed a crack near the aerator letting water spray everywhere. I don't know where my paperwork is for the old faucet to make a claim under the warranty. Rated 1 out of 5 by blhktpdude from piece of junk Bought this faucet three months ago and the sprayer line detched from the faucet flooding my kitchen. 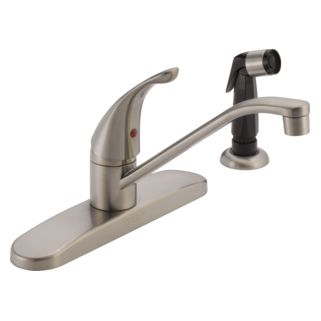 Rated 1 out of 5 by Anonymous from P115LF-W makes strange noise Purchased peerless p115lf-w single handle kitchen faucet with sprayer from a local superstore. The inner direction valve makes random strange noise and seems low quality. Wonder how long it will last. Rated 5 out of 5 by Vic from Love this faucet! This faucet is great! But what I am really impressed with is the Peerless Company. 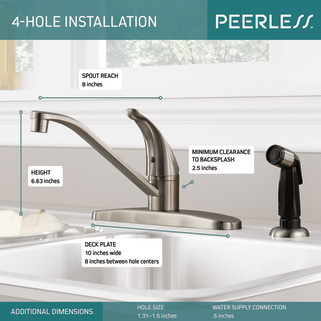 It is a replacement for a faulty Peerless faucet I bought 3 years ago. The company replaced it with no problem. At no charge! Way to stand behind your products!!!!! 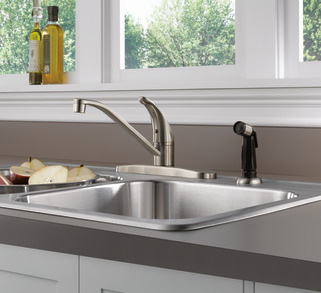 Is it OK to use Stain-Free Plumber's Putty to mount the faucet as there is a gap under the gasket which allows water to leak into cabinet? Should the 2 copper connectors swivel 360' ? How do I tighten the handle? The handle is loose and I would like to tighten it back down. If I jiggle it a little bit it pulls away from the faucet as if it is about to come off but then stops. I don't want to pull too hard and break. On other faucets I see a hole for an allan wrench to remove or tighten the faucet handle. I see no hole on this handle. Please advise. How do i disconnect the quick connect hose for the sprayer?